Have your children ever seen a tap dancing sculpture or clouds trapped inside a box? 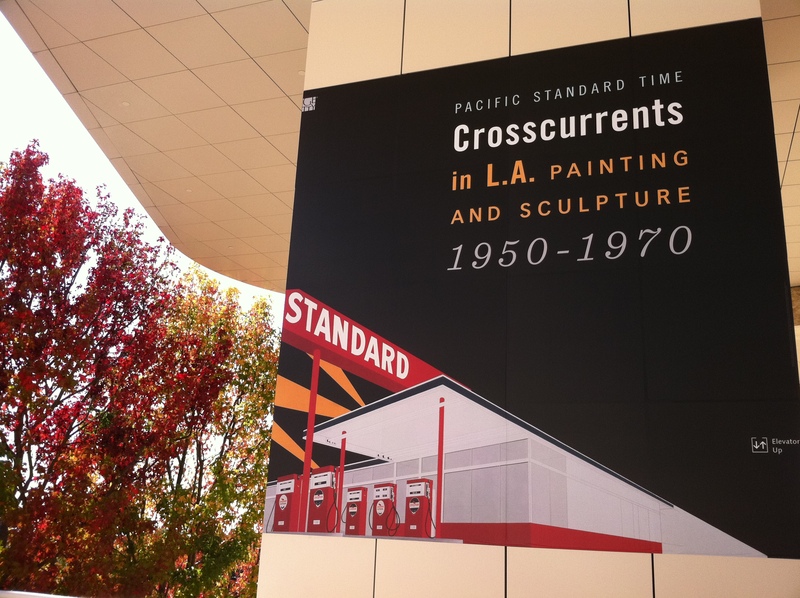 Well, those are just a few of the engaging works of art your family will discover at the Getty Museum’s Pacific Standard Time: Crosscurrents in L.A. Painting and Sculpture, 1950-1970 . But don’t wait too long because this Pacific Standard Time (PST) exhibition closes this Sunday, February 5. About the Exhibition: Crosscurrents has a wow factor that cannot be denied. In part because many of the artworks are literally and figuratively big. Most kids won’t recognize the significance of paintings by modern-day masters David Hockney and Ed Ruscha. But the monumentality of these large-scale works, and their striking aesthetics, will get their attention. And so will John Mason’s large ceramic pieces, especially his Blue Wall which spans 21 feet. 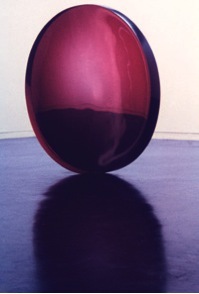 Also, not to be missed is De Wain Valentine’s huge 8 foot resin sculpture Red Concave Circle. Getty curators discovered the previously unknown location of this work in a bank lobby in Milwaukee. Smaller pieces captivate children too — I’m told Peter Alexander’s small resin sculpture Cloud Box is a favorite on Getty school tours. It took 40 separate casts of resin to create the cloud-like water vapor formations trapped inside the clear resin cube. Another favorite is the Tap Dancer. It’s one of the first objects you’ll see in the exhibition. Get ready for a surprise because it actually dances now and then. If you have time, there’s a large Pacific Standard Time sculpture you’ll enjoy in the West Pavillion. De Wain Valentine’s towering resin sculpture Gray Column stands 12 feet high and weighs about 3,500 pounds. We walked around the sculpture and marveled at how different it looked from every angle. We had fun seeing our reflections change as we moved around. 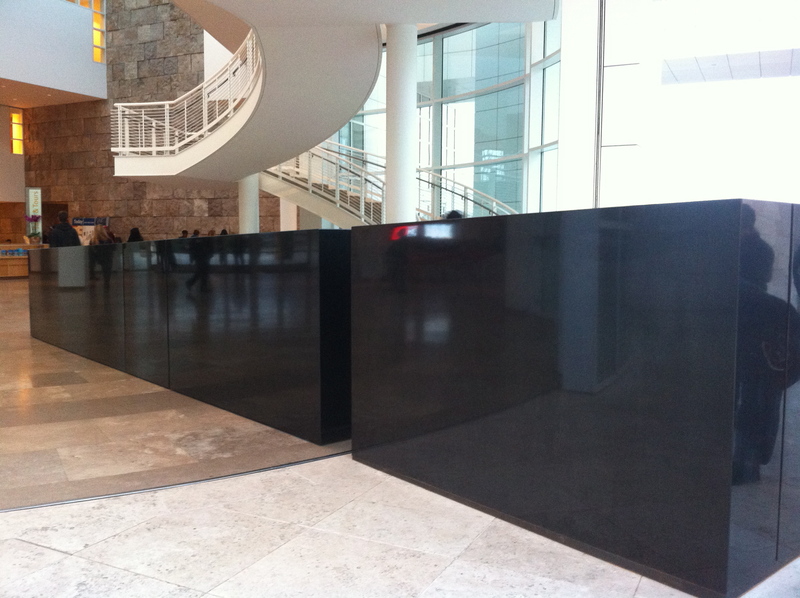 On your way in or out, don’t forget to check-out Robert Irwin’s Black and White granite sculpture in the Museum Entrance Hall. Below are two more activities to enhance your family visit: one high tech activity, and one old school pencil and paper activity. PST iPod Touch Audio Guide: Tech savvy kids can listen to the Pacific Standard Time iPod Touch audio tour (available at the entrance), or download the app on a mobile device. It’s full of interesting stories told by curators, historians, and even the artists themselves. Best of all the audio tour is free until the show closes on February, 5. My PST Collection – A Kids Gallery Activity: I created this gallery activity for my children to introduce them to the concept of collecting – an integral part of the museum world. Just like J. Paul Getty and other wealthy founders of Los Angeles museums, kids enjoy collecting their favorite things. So why not let them pretend to collect PST art objects? Just print out the activity sheets, and bring pencils and a clipboard or pad to write on, and you’re ready to go. Posted in Exhibition Reviews, Getty Museum. 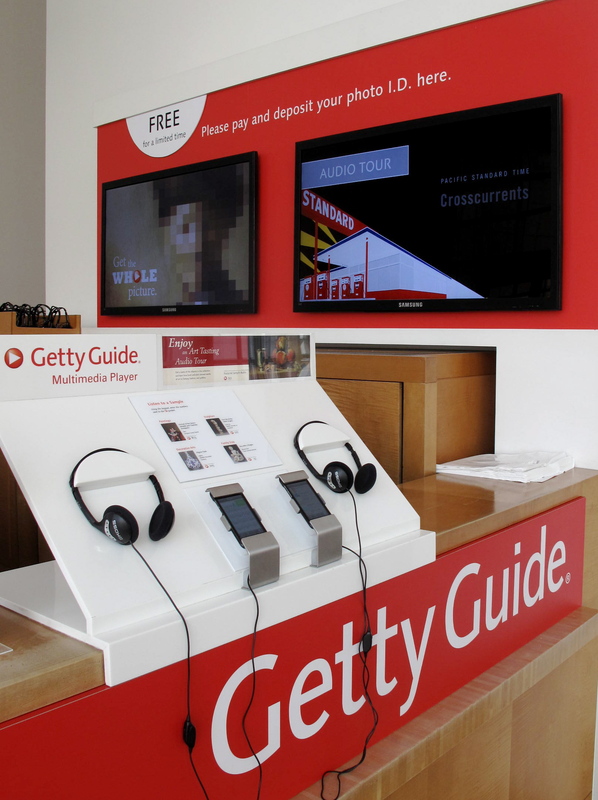 Tagged as family activities, Getty Museum, kids activities, Los Angeles, Museums, Pacific Standard Time, things to do in L.A.